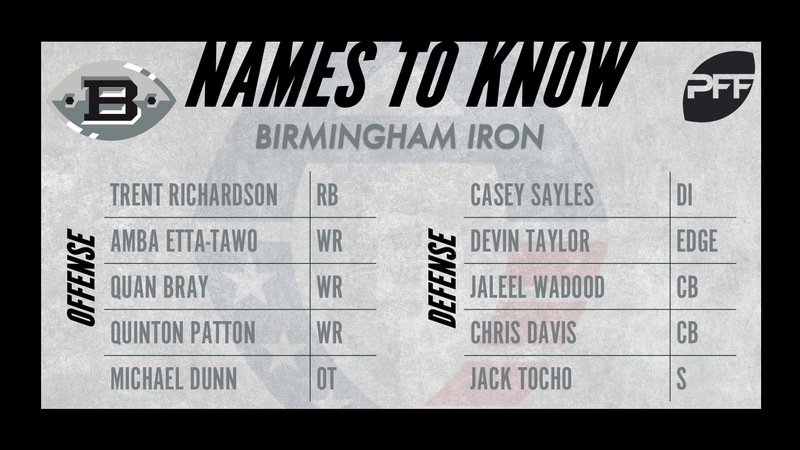 We continue the list today with the Birmingham Iron, head coached by Tim Lewis. Everyone remembers the 2012 NFL Draft, right? Then-third overall pick Trent Richardson is looking to rebuild his football career after fizzling out of the NFL after three regular seasons that spanned 1,819 snaps. His rookie season saw his career-high grade in 2012, but he never was able to do much from there. Still, Richardson did show the ability that made him a Heisman Trophy finalist and a high draft pick at times, forcing 109 career missed tackles and gaining 1,306 of his 2,029 rushing yards after contact. If he can revitalize his playing days back to that rookie or even college form, the Iron have themselves someone with a chip on their shoulder to tote the rock in 2019. Etta-Tawo put on a show during his final season in college after transferring to Syracuse from Maryland for the 2016 season. In that last season, he saw a whopping 143 targets, hauled in 94 receptions and gained 646 of his 1,480 yards after the catch. Of his receptions, 14 went for a score and an additional 44 went for a first down as he also forced 12 missed tackles after the catch. He’s a threat to get open, a threat in the open field and a threat to run right past slower defensive backs. While he caught just six passes in two seasons with the Indianapolis Colts from 2016-2017, Bray heads to Birmingham with an impressive final season at Auburn under his belt. He’s a true after-the-catch threat, as he forced 12 missed tackles on just 39 receptions during his final season with the Tigers. With Etta-Tawo manning the outside, Bray should feast over the middle of the field from the slot. A veteran for all intents and purposes here, Patton has played 1,336 regular season snaps for the San Francisco 49ers in his career stemming from 2013 to 2016. While he hasn’t played meaningful snaps since that 2016 season, his experience should go a long way in the receivers room as well as on the field in the AAF. Dunn capped three years of grades that we have for him with his final season at Maryland in 2016 by giving up a career-low 11 total QB pressures. For those three years we have grades for him in college, Dunn allowed just 43 total QB pressures across 1,151 pass-blocking snaps and never graded below 80.0 in pass-blocking. 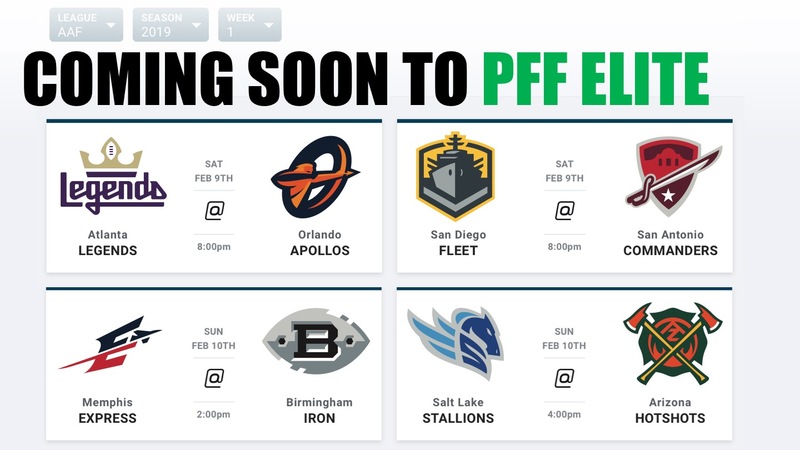 That type of consistency is something to watch as he has the potential to dominate in the AAF. Sayles was a monster in his final season for the Ohio Bobcats in 2016, registering 37 pressures from the interior of the defensive line to go along with 22 defensive stops. While he wasn’t able to replicate that with neither the Rams or the Steelers in either of the two past preseasons, his track record for improvement from his college days bodes well for him here. Taylor’s last snap came in Week 10 of the 2017 NFL season for the New York Giants after he played out his rookie contract with the Detroit Lions from 2013-2016. While he never broke through with an astounding grade, he was solid across the board in his four years with the Lions, registering 103 pressures on 1,149 pass-rushing snaps. His long-frame and speed should allow him to do even better numbers here with the Iron. One of the more impressive resumes from a college grading standpoint, Wadood logged 3,186 total snaps for UCLA from 2014-2017, doing so with some at-time exceptional results. He allowed a reception over 41 yards just once in his career despite seeing 121 targeted passes, and he finished his college career with three interceptions and 10 pass breakups. If he can nix the missed tackles that plagued his time with the Bruins, he could be a true shutdown corner in the AAF. A speedster from Auburn, Davis was more than just a threat as a kick returner but never truly got the chance during his preseason tenure with the San Francisco 49ers after 112 snaps with the Chargers in 2014. He has plus-coverage ability and can track any receiver from a speed standpoint that’s thrown in front of him. Tocho plays an old-school variety of football, sometimes risking sure tackles for a highlight-reel hit but he put it all together in 2016 at NC State. That season, he finished with a career-high 86.5 overall grade as he limited quarterbacks to just a 50.0% completion percentage on throws into his coverage while he intercepted two passes and broke up seven more. His lone game this past preseason with the Minnesota Vikings saw him put forth an elite game grade of 90.6 showing his talent and ability are still very much intact.